Austrian preacher; born at Prague at the end of the eighteenth century; died there about 1860. He studied Talmud at Presburg under the direction of Meshullam Tismenitz, and later at Alt-Ofen with Moses Münz. In 1826 he was appointed preacher in his native town, a position which he held until his death. 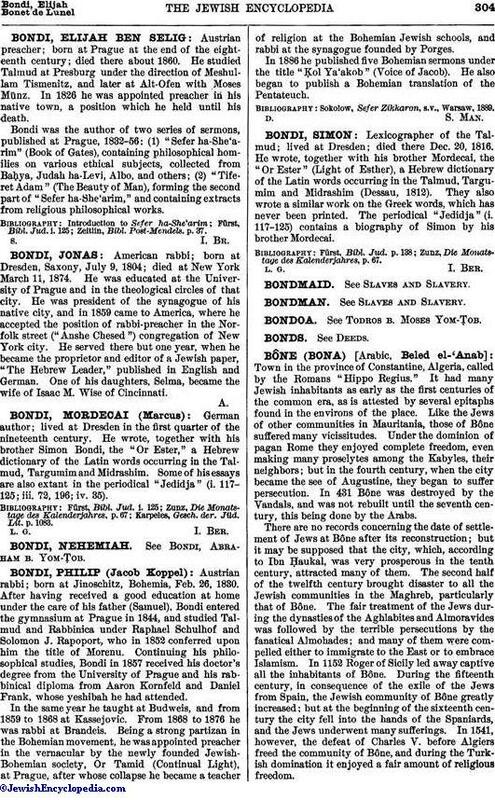 Bondi was the author of two series of sermons, published at Prague, 1832-56: (1) "Sefer ha-She'arim" (Book of Gates), containing philosophical homilies on various ethical subjects, collected from Baḥya, Judah ha-Levi, Albo, and others; (2) "Tiferet Adam" (The Beauty of Man), forming the second part of "Sefer ha-She'arim," and containing extracts from religious philosophical works. Zeitlin, Bibl. Post-Mendels. p. 37.